Enjoy your favorite summer traditions while grilling tasty foods outside with friends and family with this BBQ Grilling Tool Kit by Chef Buddy! This kit features a variety of necessary barbecue tools and a durable and appealing aluminum carrying case for extra ease and storage. Designed for both beginners and experts, you’ll be ready to warm up the BBQ, put on your apron, and start grilling instantly! 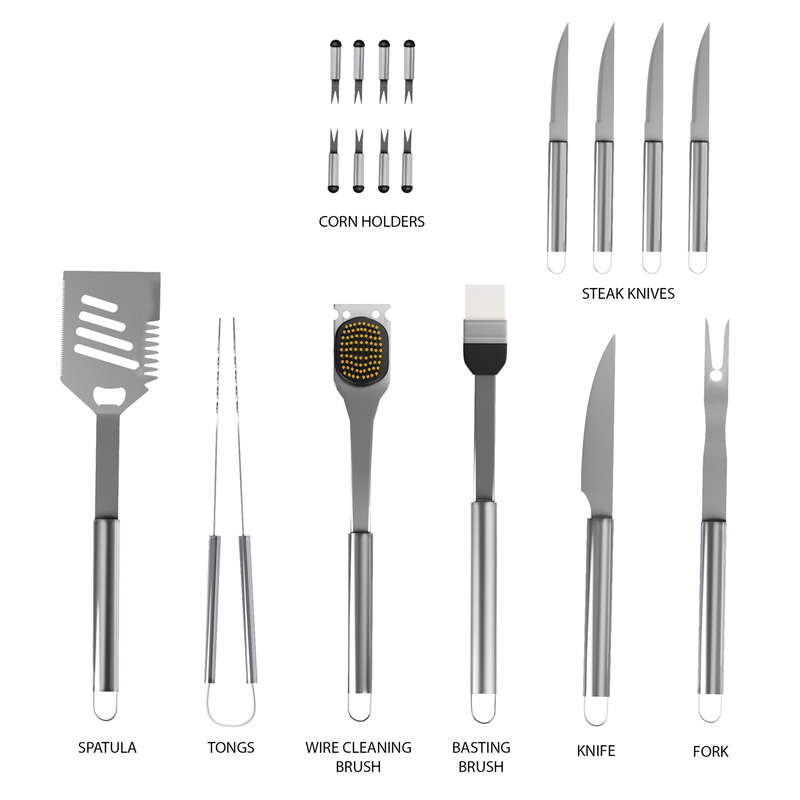 COMPLETE PACKAGE – The specific purpose of the utensils ensures you’ll have the right tool to grill all your favorites. Season mouthwatering chicken with the basting brush, flip hot dogs or hamburgers like a pro with the sturdy spatula or tongs, and enjoy juicy grilled corn on the cob while protecting your hands with the corn holders. CONVENIENT STORAGE – The compact custom carrying case ensures these tools are kept neatly stored whether enjoying summer picnics at home or while camping. 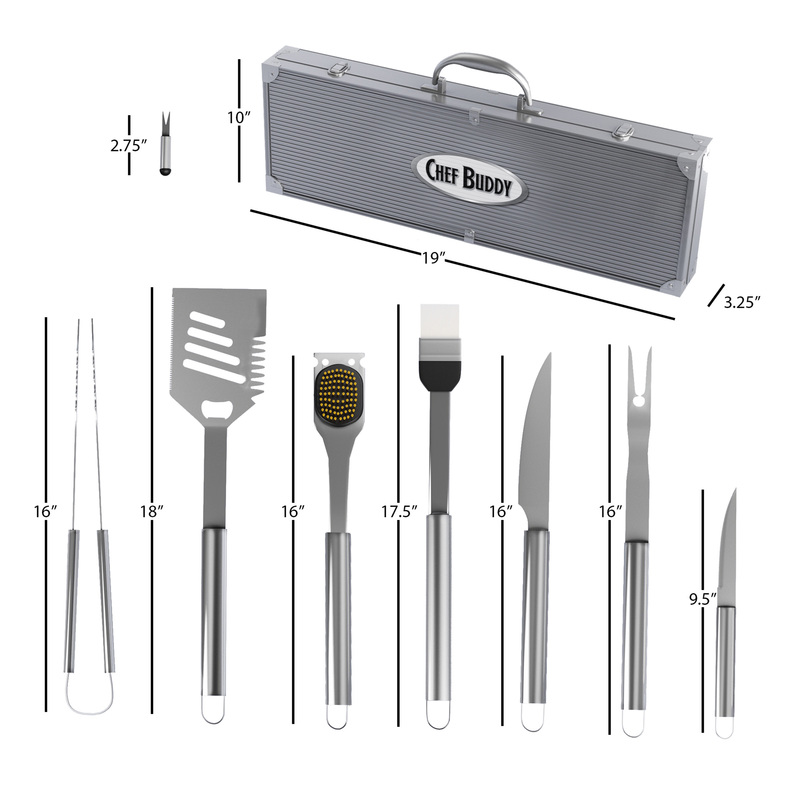 Simply grab the comfortable handle of the case and embark on your bar b que journey! The complete kit also makes for a perfect gift with a personalized feel for the grilling enthusiast, with an attractive appearance and strong material. 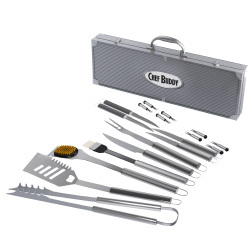 GRILLING MADE EASIER – Ease is key with this barbecue tool set. Each piece has a handy loop making them easy to hang while grilling. The stylish case is designed with sturdy aluminum to withstand long use and frequent travel. 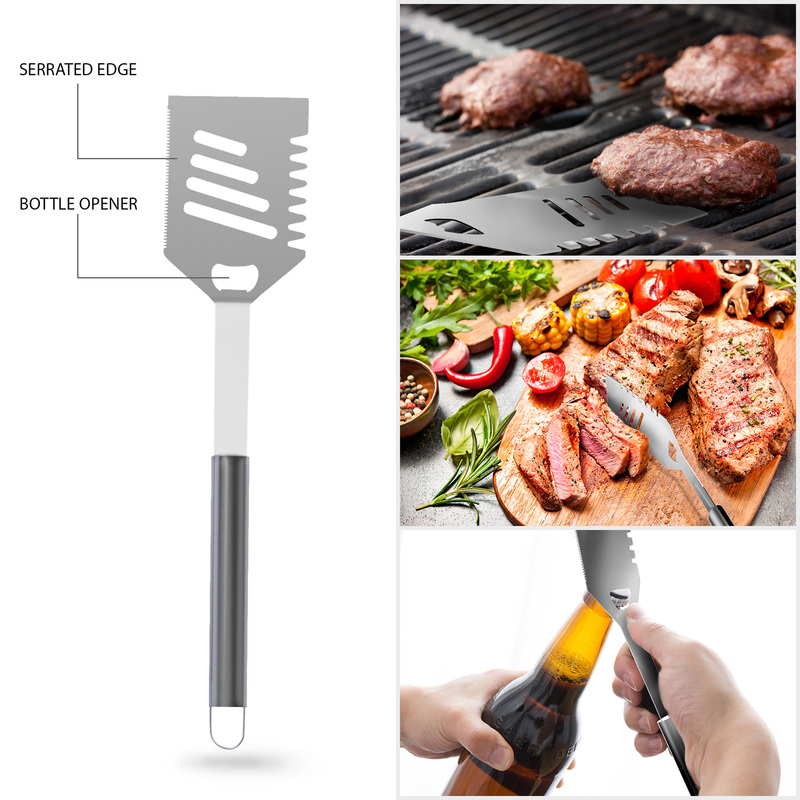 The multi-functional spatula includes a combination bottle opener built right into the body of the tool. All accessories are made of easy to clean and long-lasting stainless steel, making clean up a breeze! PRODUCT DETAILS – Case Dimensions: 18.875” (L) x 11.5” (W) x 3.125” (D). Case Material: Aluminum. Tool Material: Stainless Steel. Set Includes basting brush (17.5”), all-purpose cutting blade (16”), jumbo barbecue fork (16”), wire grill cleaning brush (16”), grip tongs (16”), 8 corn holders, 4 serrated steak knives, and an 18” spatula with a built-in bottle opener. All utensils are dishwasher safe. SATISFACTION GUARANTEED – Chef Buddy is committed to providing consumers with the absolute best price and value on our entire line of products. NOTE: This is an exclusive product of Chef Buddy and ONLY BBQ Grilling Tool Kit, 19 Piece by Chef Buddy are GUARANTEED to be genuine.